If you want to learn animal massage, Jean-Pierre recommends you to acquire a solid foundation in the proper application of animal massage by watching and learning from the first seven mini-videos. As you develop your massage skills, you will secure the many benefits associated with massage. For you who want to be an integral part of your active dog training, or to care for your aging animal with regular massage, Jean-Pierre recommends you to further develop your skill by watching and learning from the following seven mini-videos. For you the type â€œAâ€� animal owner, Jean-Pierre recommends you to fully expend your skills by watching and learning from the following seven mini-videos. C007 - Stretching General - Neck, Back, Limbs. Jean-Pierre Hourdebaigt, CEO, personally offers you 30 years of his experience as a massage therapist, lecturer and internationally published author. 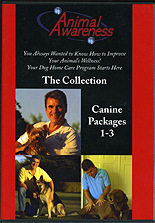 He will help you develop a home care program to improve your animal in health and well-being. This include some simple massage tips, gentle stretching exercises as well as some heat and cold modalities. They will allow you to quickly attend to your animal's needs.